It’s been real tough for a salty chick to come by a laugh these days, so Gaiman’s satirical title promised me some fun. 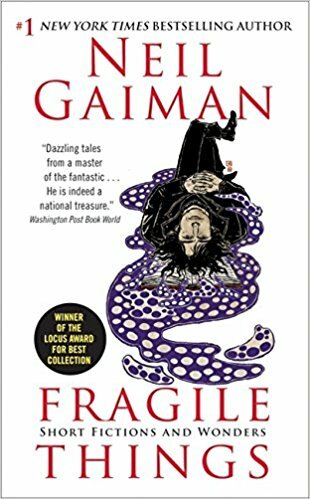 After first reading the graphic novel adaptation of “Forbidden Brides,” illustrated by Shane Oakley, I then dove headfirst into Fragile Things for the original version, where I sought a tale of Gothic motifs featuring the forlorn creatures I’d hope to find at the old cemetery, manor ruins or writer’s desk. “Forbidden Brides” spoke to the creative process, of how ghouls such as doubt and uncertainty make art as they roam with the writer’s pen onto the page, whether its contents have been summoned from the realm of fantasy, realism, horror, or the Coney Island boardwalk. Although “Forbidden Brides” was a short piece that kept things odd and humorous, it reminded me that stories are vessels, transporting imaginations to worlds of the familiar (and unfamiliar) and transforming our understanding of those places, their ghosts, and ourselves. Neil Gaiman’s fantastical tales set my mind abound with magic and terror, as I sunk into the clawfoot tub, book in scaled hand, and found myself at the Mermaid Parade in spirit. Next up in the Fragile Things treasure trove is “Fifteen Painted Cards from a Vampire Tarot,” and you can bet Queen Amphitrite’s glittering seashell pasties that this short story’s title alone has already left mer-me shipwrecked, and feeling right at home. *This book blurb is part of our Summer Reading Recommendation series.